Whether you are a fan of the show or not, this free pattern from Anorina at Samelia's Mum is adorable and you could easily add your own quote. I happen to love the show and the new series. I listen to the theme song Where You Lead by Carole King on every episode! It was a lot of fun picking the fabrics. 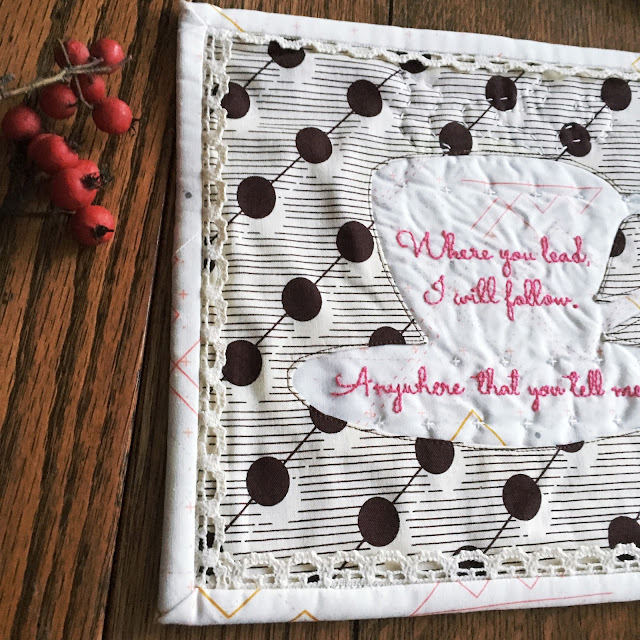 The soft Make Drafts, Maker by AGF Studio is a sweet cup and I tried to balance it with the bold Shadow Dot, Hadley by Denyse Schmidt, which also fits nicely with the coffee theme! 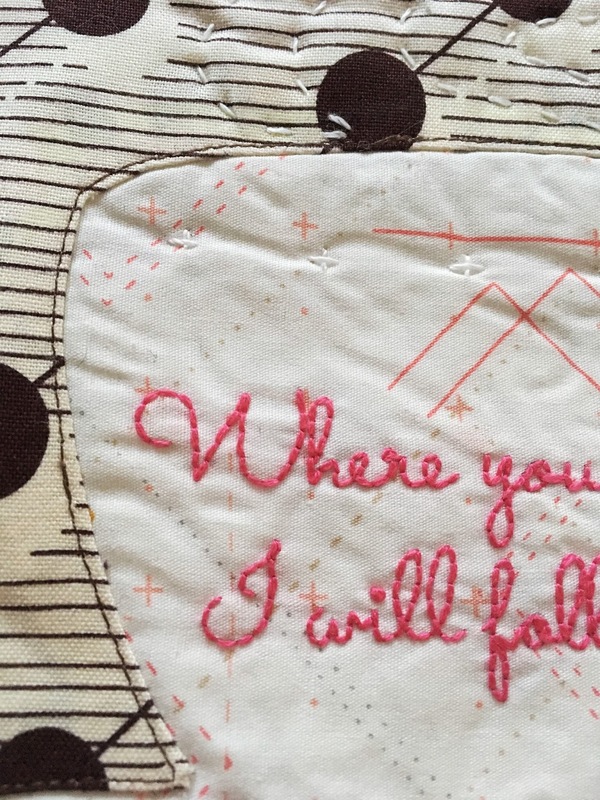 I enjoy doing embroidery and a little project like this is a nice quick make. I used two strands of Aurifloss #2530 and a simple backstitch for the text. I added some hand quilting, steam coming from the cup and some little crosses to mimic the fabric print, using Aurifil 12wt #2021. This is my first time doing reverse appliqué and, while it's far from perfect, I'm really pleased with it and definitely want to do more. I had no clue what I was doing so I used this Fons & Porter video tutorial to help me. 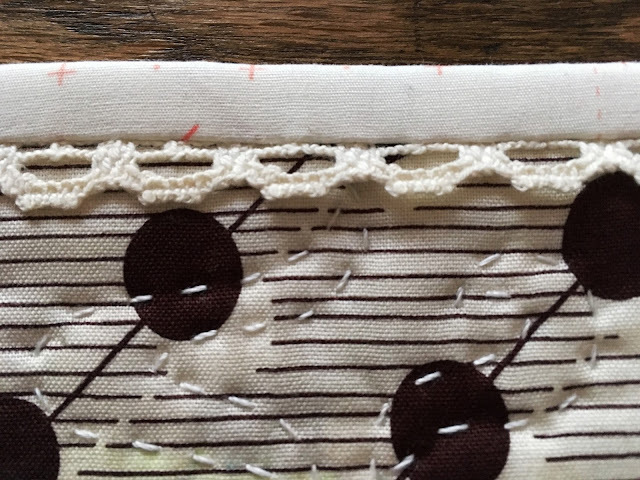 I had the perfect brown Aurifil 50wt #1285 to do the top stitching. I did needle turn appliqué the cut out of the handle but it looked odd without the top stitching so I added it! 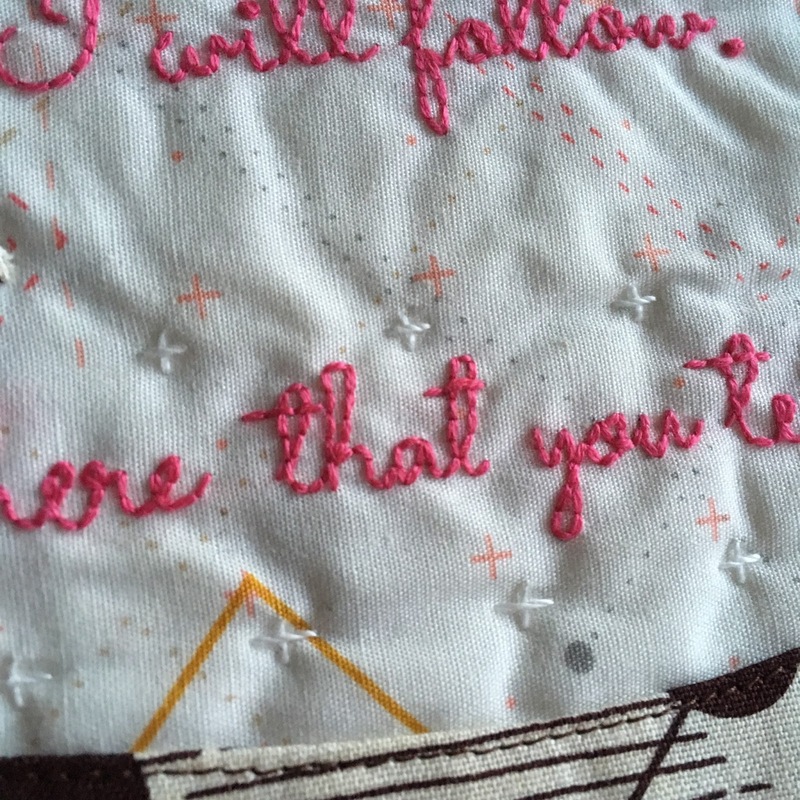 It would be super quick to make this and just do raw edge appliqué but it was nice for me to try and challenge myself. 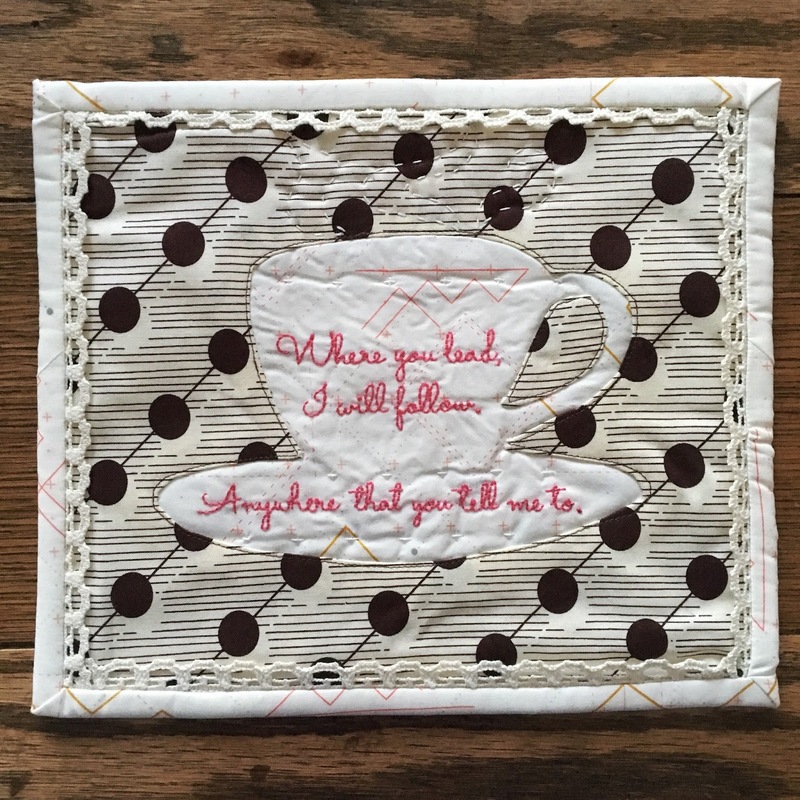 I loved Anorina's mug rug so much that I decided to add in some trim. I have a bag of it that someone gave me and is the perfect finishing touch! Now I'm not sure I want to put my coffee on it so it might live on my bedside table instead! 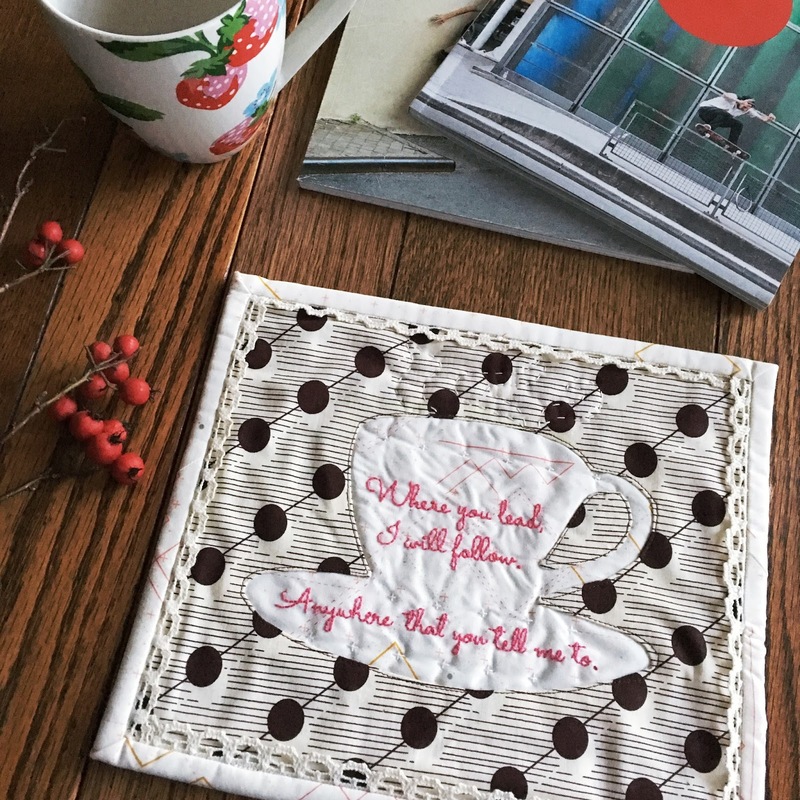 Love this mug rug. Beautiful work as usual Lucy!